You just created your first dashboard. Now what? Well, it’s time to create widgets and make this dashboard your own! The whole process is just a matter of a few clicks (between 2 and 4, actually). The top left corner of the screen is where you’ll find the widgets. There are three dropdown icons: one for the preset widgets, one for the custom widgets, and one for the static widgets. The preset widgets are popular metrics and/or KPIs that our experts have pre-selected for you. It’s the place to go if you’re in a hurry, or if you’re still not familiar with the world of metrics. They’re all grouped by category to simplify your research. How convenient! If you want to add a preset widget, click the icon, select the category, and then choose the metric. The widget will appear in your dashboard all by itself! Custom widgets give you up to nine widget types to choose from, such as a pie, stacked columns, gauge, or other. These widgets can be entirely customized: you’re in control of everything. If you choose to use custom widgets, you first need to choose the type you want. Then you can choose your data source. Some types, such as the stacked columns, require a dimension. Depending on the data source you’ve connected, you can also add a metric, segment and/or a filter. 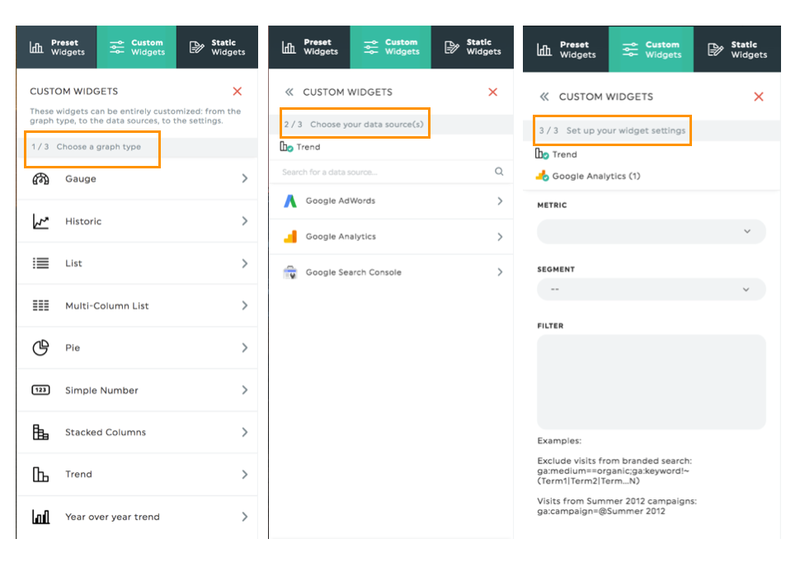 Static widgets allow you to add other pieces of information, such as comments, editable numbers, or headers with which to divide your dashboard into sections. If this is what you want, select the kind of static widget you want, and that’s it! You add the information you want in the widget itself once it’s in your dashboard. With these widgets, you can build a dashboard that suits your and your client’s needs. Learn how to use the Editor mode to make your dashboard and widgets look good! Go back to your account, and personalize your dashboard!